Extemp.ie is designed to be an easily navigable site, and the following is an explanation of the site layout. 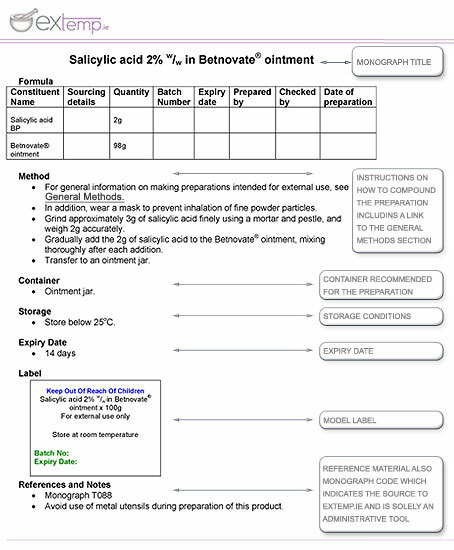 The ‘GENERAL METHODS ’ section offers information on the general principles of pharmaceutical compounding, including information specific to each type of formulation commonly encountered, namely oral preparations, topicals, sterile preparations, etc. The ‘MONOGRAPH DOWNLOADS ’ section contains an alphabetical list of the individual monographs supplied to us from the participant hospitals. A. Where more than one formula (i.e. differing actual ingredients) exists for a particular preparation; we have assigned these Formula 1, Formula 2 etc. The a and b denote to us in Extemp.ie the source hospitals that use the different storage periods. Note that the names of individual source hospitals will not be listed at any point in the individual monographs and the a,b,c indexing is for administrative use only by extemp.ie. Unncessary use of decimal points is avoided. Where decimals are necessary, a zero is written in front of the decimal point where there is no other figure, e.g. 0.5mL. Quantities over 1g are written as 1g etc. Quantities less than 1g are written in milligrams, e.g. 500mg. Quantities less than 1mg are written in micrograms, e.g. 500micrograms. Volumes are expressed in millilitres (mL) unless over 1L, when they are expressed in litres (L). Use the contact us section to email us at extemp.ie with any correspondence. Extemp.ie welcomes new monographs, information on new compounding practices and any other relevant communications. www.extemp.ie was developed and is maintained by The School of Pharmacy, RCSI, under a grant from the Pharmaceutical Society of Ireland and has also been kindly supported by Fannin Healthcare.